In just seven years’ time 1.8bn people will be living with absolute water scarcity. Tissue giant Kimberly-Clark (K-C) recently launched WaterLoupe, an analytical tool to advance the science of water sustainability… for its mills, the surrounding high risk river basins, for local communities, and the wider environmental source. 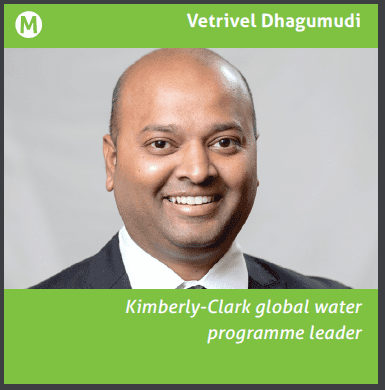 Here, Vetrivel Dhagumudi, K-C global water programme leader, explains the strategy to TWM. TWM/1: Why did K-C launch WaterLoupe? Can you explain the background behind it? Dhagumudi: “K-C’s water strategies have traditionally been focused on conservation and reductions in water use and optimising wastewater treatment and quality at our mills. However, we have learned a local watershed approach is needed to address the broader challenges associated with of water security. “We realised that lack of clean water availability could result in disruption of our operations, which would also be a problem for the communities and families relying on the watershed. “K-C and Deltares developed the WaterLoupe dashboard as a tool to raise stakeholder awareness of water risks at the local level and to encourage collaboration in developing sustainable water management plans within watersheds of concern. “Population growth is increasing the demand for water, at the same time a hotter, drier climate is threatening available supply. By 2025, according to U.N. projections, 1.8bn people will be living in regions or countries with absolute water scarcity and nearly two-thirds of the world’s population could be living under water-stressed conditions, up from one billion in 2005. The world’s poorest countries and the poorest communities within them are the most vulnerable to inadequate management of water resources. Water management: WaterLoupe is employed at Kimberly-Clark’s mill in Cuaca, Colombia. The company’s aim is toengage government authorities, farmers and industries in discussions regarding local water use. TWM/2: What key issues are you and the tissue industry generally facing in terms of water sustainability? Dhagumudi: “Water is one of the world’s most vital resources and a key input material to our tissue manufacturing operations. In 2015, we conducted a water risk screening assessment to determine which of our operations are at high risk for water stress, recognising that constraints on water supply could affect our future operations in these areas. “On the production side, we are focused on mills in high water-stress locations to reduce water use, improve waste water treatment, and increase recycling of water within the production process. TWM/3: How does WaterLoupe work? Dhagumudi: “WaterLoupe is an innovative web-based tool to share data and insights on current and future risks to local water resources. It tracks data on social, economic and climate factors impacting water availability within river basins and displays the information on a highly visual, user-friendly dashboard. The WaterLoupe dashboard visualises the water scarcity risks to all stakeholders at the local level and provides insights into water demand and supply, so that all parties can use freshwater more efficiently and sustainably now and in the future. TWM/4: What is unique about it? TWM/5: What are the main opportunities and challenges in the next few years in terms of water sustainability, and how are you reacting to them? TWM/6: How does WaterLoupe help the local community? Dhagumudi: “The WaterLoupe tool allows users to assess local water risks for an entire watershed as well as specific sectors and sub-groups, such as industrial users, farmers and households, over a 30-year time horizon. 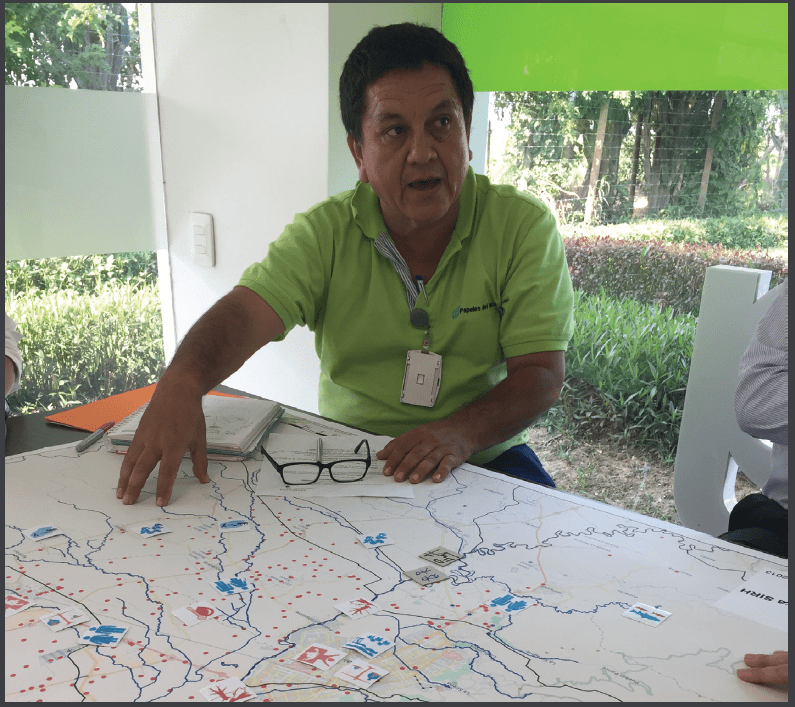 Insights from WaterLoupe can help local stakeholders understand the challenges and participate in creating sustainable water stewardship goals and action plans. TWM/7: How will you develop WaterLoupe? Dhagumudi: “Ultimately, we hope to use this tool to develop water management plans for our mills and the surrounding communities. Over the next four years, K-C plans to extend this process to all of our mills located in high-risk watersheds. By 2022, we expect to have developed targeted goals and implemented appropriate plans to improve water security for these mills and the surrounding communities. “The WaterLoupe tool will provide key insights to establish those goals and model the impact of potential solutions to meet them. “At present, we are working with Deltares to further refine WaterLoupe and add capabilities that will enable users to explore different strategies to reduce local water risks, based on alternate environmental, social and economic scenarios. Over the coming months, K-C and Deltares will present the dashboard to their NGO partners and other manufacturers to obtain feedback on its functionality and content and identify further improvements. Share the post "Kimberly-Clark reaches out to advance the cause of preserving precious water"